I’m running out of superlatives for this summer. There has already been 15 days where the temperature has reached or exceeded 30C, two more than 1976! However, the mean temperature has not been as intense as that classic summer where two heatwaves of five days and four days length were featured during the season. This summer has so far only seen one similar heatwave of 5 days length. I’ve put together a few top 10s of stats for Wanstead, St James’s Park and Heathrow for the month of August. In terms of climatology August maxima, considering the 1981-2010 average, shows a fairly steady decrease through the month, though around the 15th there is often a spike before a steady decrease to month’s end. This would reflect the late August winds singularity which occurs every year around the 20th at 67 per cent probability. The average rainfall graphic shows that downpour amounts are fairly random from year to year. The driest days are the 15th and the 30th. With the recent warms months of April and May you’d be forgiven for thinking that we’re in for a hot summer. Indeed the recent pattern of weather, would it repeat over the next month, could see many maxima records tumbling. A look at local east London stats shows that six of the last 10 Junes have been warmer than average while half have been much drier than average. I’ve put together a few top 10s of stats for Wanstead, St James’s Park and Heathrow for the month of June. Probably most notable from the below values is that recent Junes have been devoid of extreme cool temperatures and rainfall. Snow has been known to fall in June, in 1975. Rain is usually most frequent in the last week of the month. In terms of climatology June maxima, considering the 1981-2010 average, shows a gradual increase through the month, though around the 19th to the 21st there is often a dip before a warm end. This would reflect the June Monsoon which occurs every year at 77 per cent probability. The average rainfall graphic reflects this, showing a four-day wetter spell after the 20th. Ne’er cast a clout till May is out. With the recent March and April weather being so variable it would be wise to bear in mind this old saying, especially with fine and warm weather forecast for the Bank Holiday weekend. 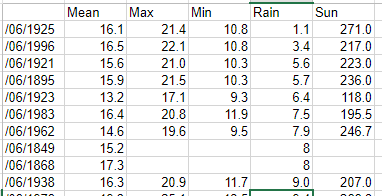 A look at local east London stats, however, shows that seven of the last 10 Mays have been warmer and drier than average. Probably most notable from the below values is that recent Mays have been devoid of extreme cool temperatures and rainfall. With nights now relatively short air frosts are uncommon though the odd ground frost can still strike on a clear night. Snow can fall in May – one example being 1979 in the higher parts of the capital – but after the first week it is extremely rare. Hottest: 22nd 1922: 32.8C at Camden Square, London. In terms of climatology May maxima, considering the 1981-2010 average, shows a gradual increase through the month, though around the 25th there is often a brief dip before a warm end. The average rainfall graphic reflects this, showing a three-day wetter spell after the 24th.